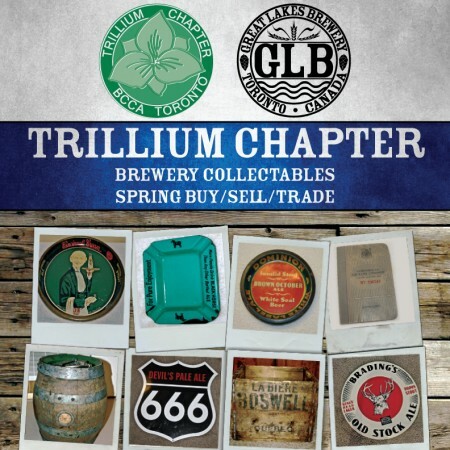 TORONTO, ON – The Trillium Chapter of the Brewery Collectibles Club of America will be holding its Spring 2016 show and sale tomorrow (Saturday April 2nd) at Great Lakes Brewery (30 Queen Elizabeth Blvd., Toronto). Running from 11:00 AM to 2:00 PM the show will feature members and non-members of the club selling and trading a wide variety of breweriana including cans, bottles, labels, signs, openers and more. There will also be a display of bottles, glassware, tap handles and other items from Great Lakes Brewery history, and beer writers Stephen Beaumont and Jordan St. John will be on hand to sell and sign copies of their books. Admission to the event is free, and there will be several Great Lakes beers on tap for $5 a glass, and savoury pies from The Pie Commission. The Great Lakes retail store will also be open, with two new beers – Harry Porter and the Curiously Spiced Cocoa Bean and Currant Affair Black Currant Belgian Dubbel – in the fridge, along with other new and old favourites.